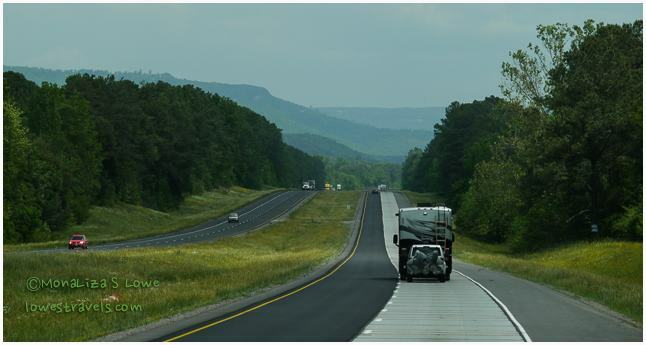 Moving on and pointing Betsy’s nose northward, we arrived in a new-to-us state – Tennessee – Chattanooga to be exact. 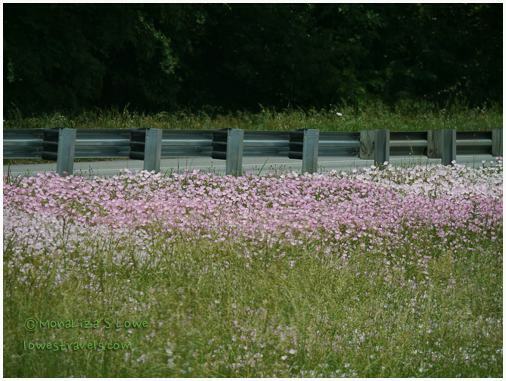 Along the hilly highways of the area, wildflowers adorned the sides of the road in an explosion of pink, yellow and white. I was delighted that spring is still in the air, and I loved it! After settling in at our new home base, we perused several brochures to see what’s to do in Chattanooga. 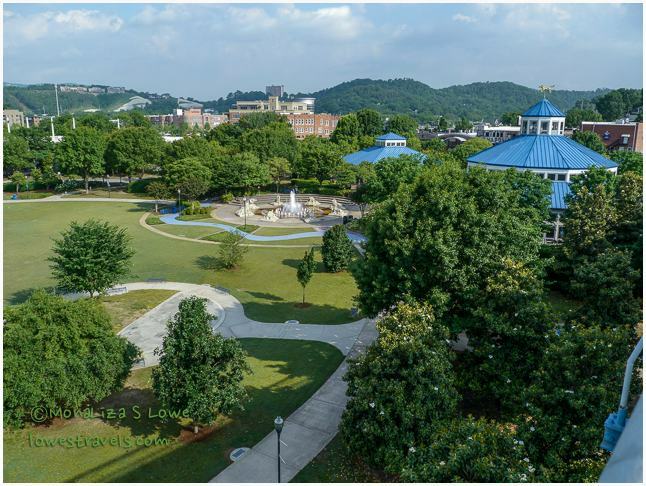 As many cities do, Chattanooga boasted the many rave reviews they have garnered. To validate these claims, we had to do our own investigation to see for ourselves. 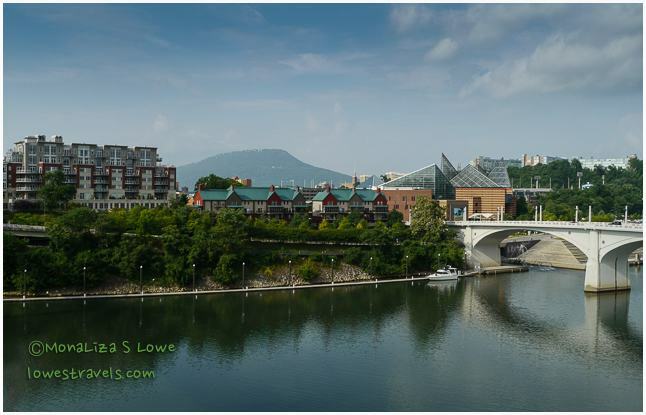 Chattanooga is nearly surrounded by mountains and sits on the banks of the Tennessee River. Folks here have officially nicknamed it “The Scenic City,” and we were pleasantly surprised to discover that it really is. Getting around town is easy since they offer a free electric shuttle, but it is very walkable and we opted to use our legs. 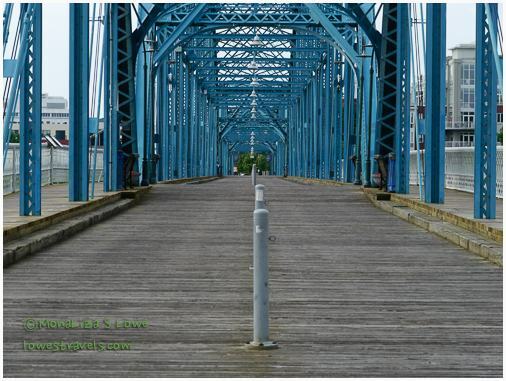 Leaving our car at a good central point, we headed straight down to the Walnut Street Pedestrian Bridge. 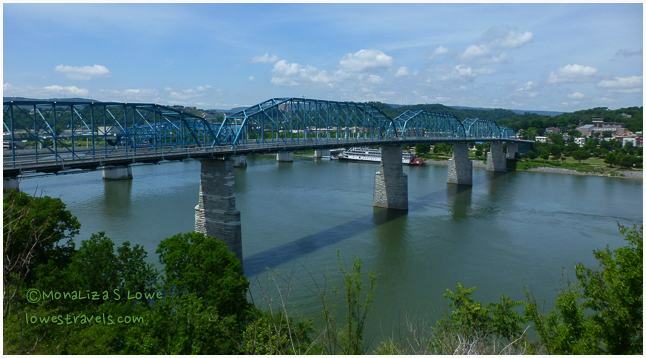 It is one of the world’s longest pedestrian bridges and spans .45 mile across the Tennessee River. A sign on the bridge indicates it was built in 1891 and added to the National Register of Historic Places in 1990. It was restored and reopened in 1993, and is obviously very popular. Walking over the river, we were able to enjoy scenic views of a city that has been transformed in recent years. I’m making the bridge my main attraction because when you’re on it you see beautiful scenery in every direction. 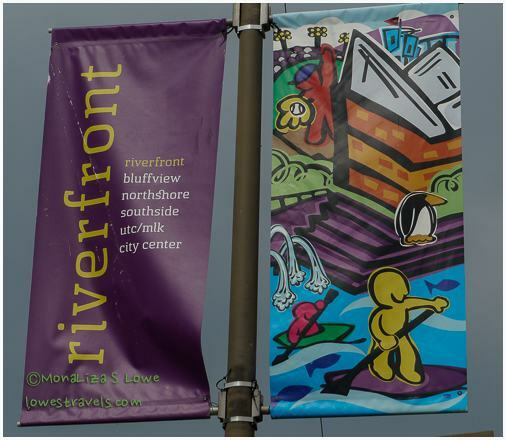 It’s not only a tourist attraction, but also a connection between downtown Chattanooga and other businesses on the north shore. 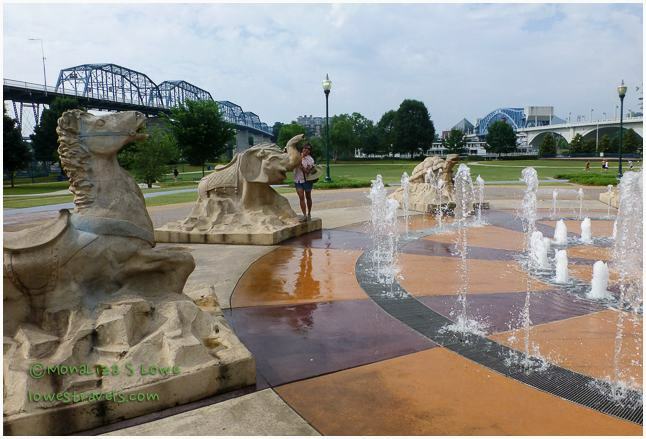 It is also sort of central to an area encompassing the 13-mile Riverwalk and Coolidge Park. This is really a vibrant and active town with many opportunities to enjoy the scenery while working out, and it’s also full of excellent restaurants in case you want to put those calories right back on. …and Coolidge Park on the north end with more walking/biking trails, and even a merry-go-round in that building to the right. After strolling through the north shore streets, we went back across the bridge to the downtown area. As we strolled along, we realized the city has designated six sections (or districts), depending on what the area has to offer. 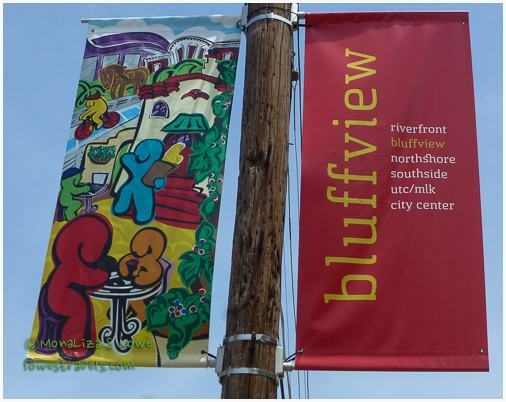 The bluff view is the artistic part of town. 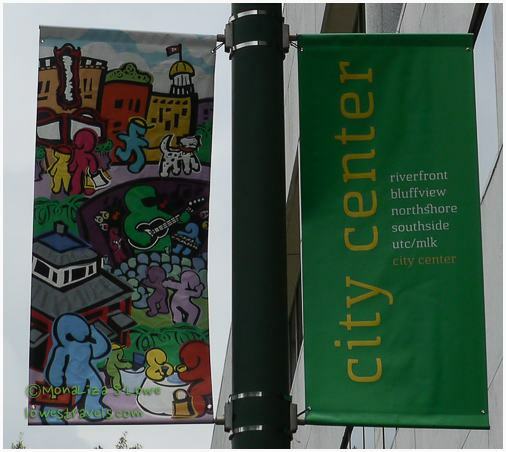 Since neither of us are art enthusiasts, we skipped the Hunter Museum and instead admired the various art sculptures displayed around the city and at the outdoor River Gallery. This is a good place to feast your eyes on various distinctive art pieces and sculptures – for free. 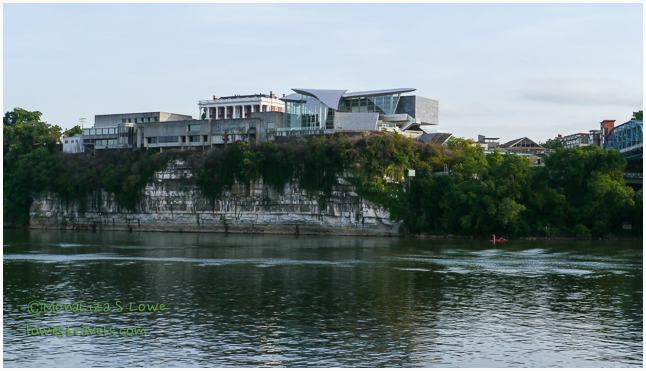 We continued to follow the Tennesse Riverwalk at the riverfront district, and cooled off on the steps covered in cascading water next to the Tennessee Aquarium complex. 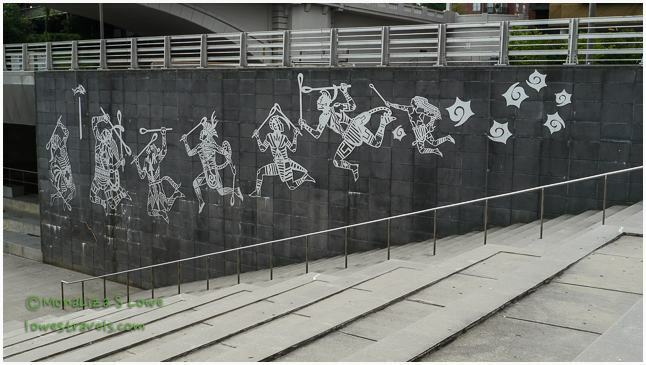 I later learned there is also a public art memorial known as “The Passage,” which celebrates the area’s Native American heritage. 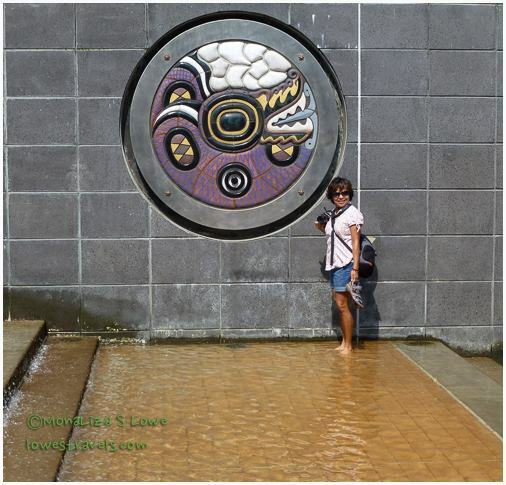 It features several six-foot medallions depicting the Cherokee tribe’s history. In 1838, when the Cherokee nation was ordered to leave their land here, many died on the westward march known as the Trail of Tears. At the foot of the cascading water is Ross Landing, designated as one of the three places for the rendezvous for their removal. 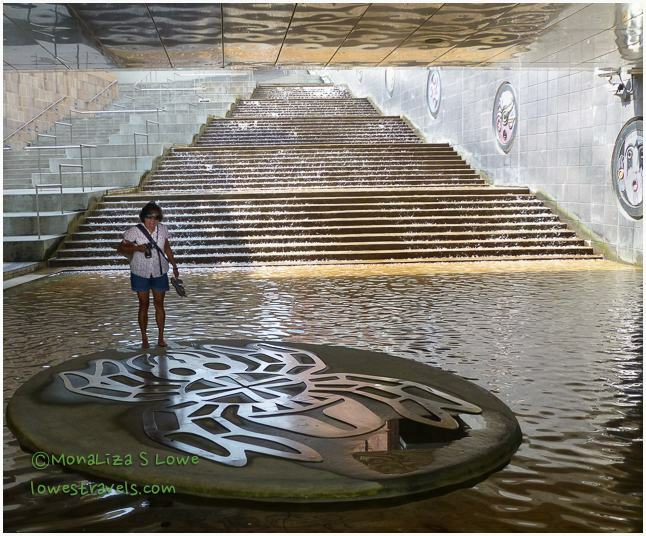 Standing on the Little Water Spider at the bottom of the “The Passage.” Yes, it’s OK for people to walk in the cascading waters steps! 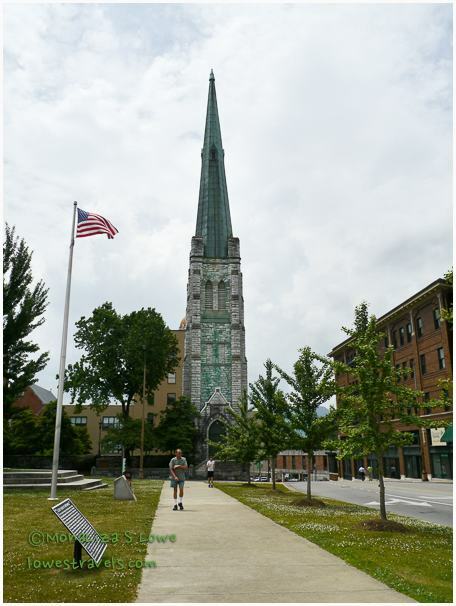 We saw an interesting steeple in the city center district that had been been built in 1881 as part of a large First Methodist Church. It turns out the church was never completed, but services were held in the steeple until 1967 when its congregation merged with another one. It looked kind of strange to see just the steeple in the middle of the city, but it is quite a beautiful structure on its own. Our tummies were grumbling after all of the walking, and Steve had been talking for a couple of days about a place he found that served excellent fried chicken. Not what we usually eat, but you know how you can get those “hankerin’s” every now and then! We walked all the way across town to a place called Champy’s, and we weren’t disappointed. We were happy to walk almost two miles back to our car after that incredible lunch! 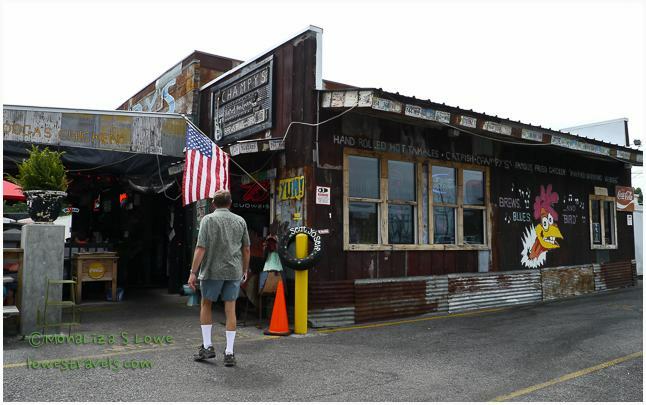 Fried chicken and cold beer – here I come! 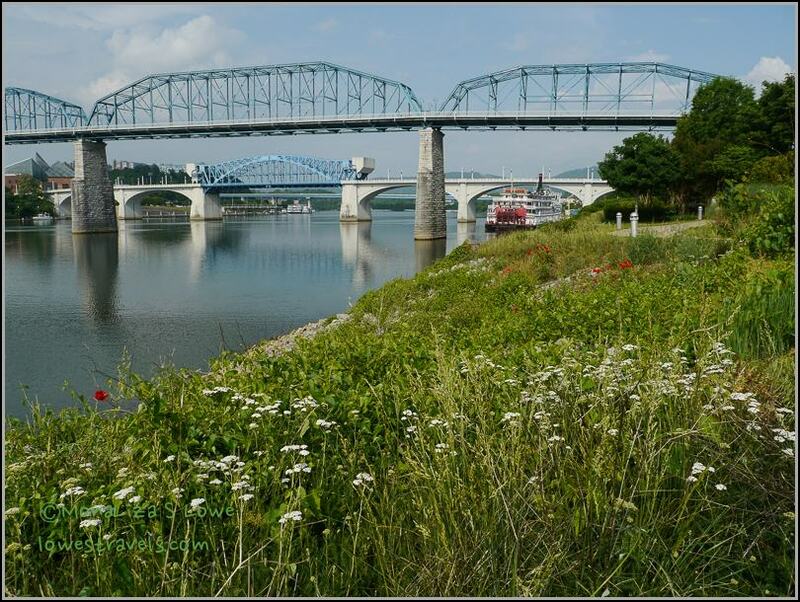 There is so much to do in Chattanooga. We walked it, drove it, biked it and hiked it. We also boated it on the Southern Belle (coming up next) to get a view from the river. By the end of our weeklong stay we were pretty much exhausted – is this what retirement is supposed to be like? Among the mid-sized cities we’ve visited, Chattanooga lived up to its hype – it’s scenic, clean, not too big nor too small, and the outdoor fun is almost limitless. 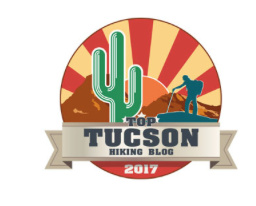 Stay tuned to see what else this cool place has to offer! Great overview of Chattanooga. Love the photo of the rainstorm over the city! And I do miss that southern cooking – southern fried chicken – yum! Great tour of Chattanooga! Choo! Choo! 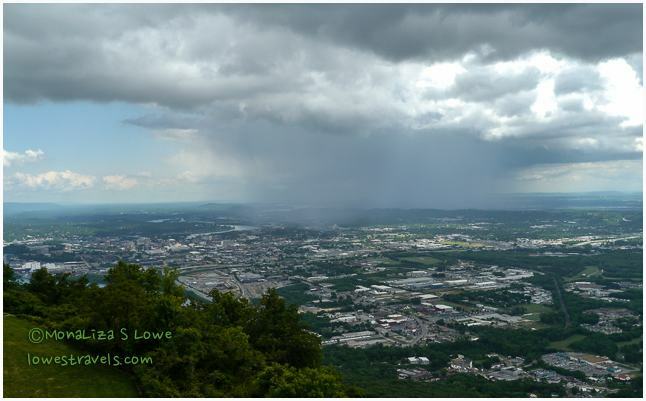 Love that photo of the storm from Lookout Mountain. You know Carol, we selectively missed the Chattanooga Choo Choo, not the song but the attraction. I didn’t realize there was an attraction. I should have known! 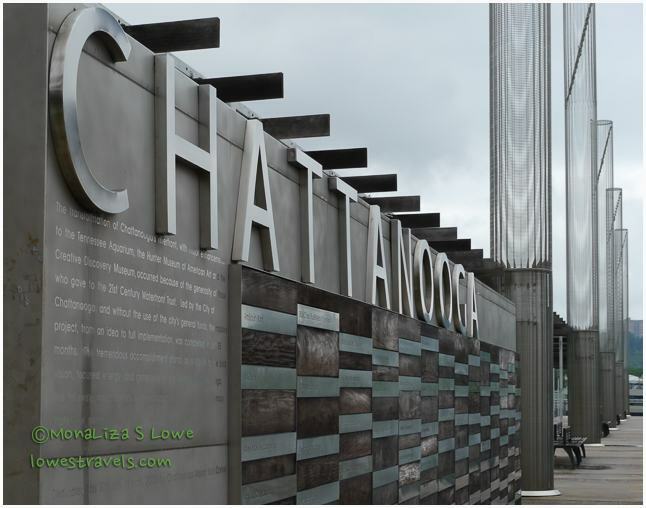 LuAnn, I think you will like and enjoy Chattanooga especially in the Art District area. There is lots to do here. If you like Art, Rommel then you would like it here. 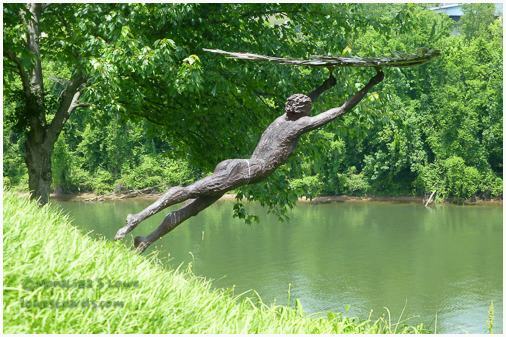 The sculptures are all over town even in the biking trail. I find that public arts are more appealing to me. We love Chattanooga…so glad you had a great time! What a nice walking tour you shared! And oh my, the mention of southern fried chicken makes my mouth water! The fried Chicken was yum! Gorgeous photos, Mona. We only stopped over in Chattanooga for one night. I didn’t realise that there was so much to see. Those sculptures and the medallions are wonderful. 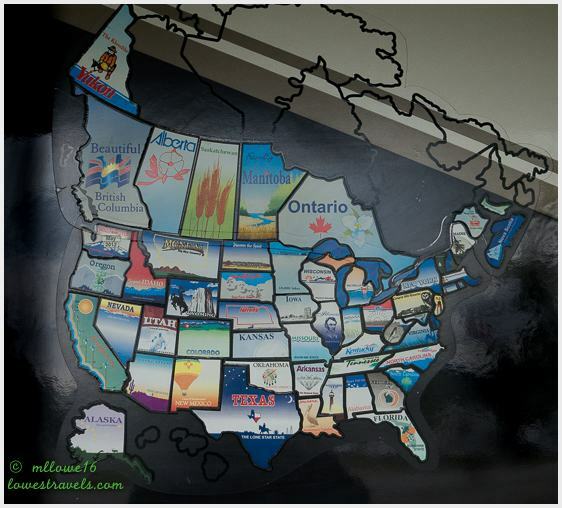 Thanks for the great tour … though we’ve been to the Smokies twice, we’ve not been west of it. The cascading steps are a neat idea. If you were here Erin, you would have enjoyed capturing the many art sculptures displayed around town. Wow! You make me want to go there! The only time I’ve been there I was 11…a little too long ago! Lisa, its time to point your 5er towards the east and revisit Chattanooga. We have driven through Chattanooga but never stopped. You did a great job on selling the city. Now added to our list. I love the sculpture garden. Keep enjoying the good life. If you like art sculpture, there is a lot of them displayed around town. Ha ha Sherry, I hope the CC will read my blog and send me something, like a free pass at the Hunter Museum. Yes Sherry the Passage memorial was created by Team Gadugi, a group of five Native American (only two of them are Cherokee) artists from Oklahoma. It was here that I first read about the Trail of Tears, a really sad tragedy. Oh so you had been here before. We had a wonderful time here with only one day of rain. Very scenic, indeed! I felt a good calorie burn just reading about all your walking! That looked fantastic. Yup, when in the southern states, its always good to keep the calorie burning after enjoying their comfort food. Oh, and I meant to say that all of the walking looks like fun, too! That’s the best kind of city, when you can explore by hiking and biking. Great photos, and you look as adorable as ever. Yes, Laurel, you caught my drive by wildflower shots… ha ha I think you will really like it here. The art displays are all over town even along the biking trail. Chattanooga sure is a beautiful place to get out in nature. I’m learning so much from reading your posts and seeing your beautiful photos. Keep enjoying life! I took my new dog Sparky Sparkles camping at New Brighton State Beach in Capitola last week and it was in the upper 90s. We still had a lot of fun playing at the beach. Now we are going to lots of music festivals and Carnaval is this weekend in San Francisco. I love this time of year. I think i have been to New Brighton Beach and liked it. Hope your new dog enjoy the toss and run exercise.